Trust is one of those themes I have been coming across on the daily of late. In my case, I’ve been contemplating how to be less anxious and trust the universe. Other friends are facing the specter of betrayal and question how to trust particular people. One friend even shared that one of her rules is not to trust anyone until they’ve proven they are trustworthy. That made me deeply sad- it’s not an easy way to go through life. If you feel you are going to be harmed by others, you never risk the connections that make this sojourn worthwhile. I think you may even unconsciously choose people who use you, break your heart, and are unkind. Most often, some terrible experience has convinced you that trusting is a naive way of being in this rough world. Trust is not naive but fundamentally human. You will come across more people that are struggling, but are genuinely good people by trusting and being open to that human connection. 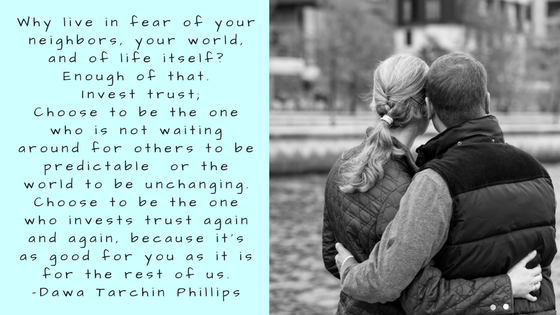 I came across the quote (that forms the header image of this blog) by Dawa Tarchin Phillips in Tricycle magazine. It uplifted me as a step in my meditation practice and have been my mantra for the last two weeks. That things work out as they should most of the time- even when we don’t like it, we need to accept some outcomes while also working to change what can be changed. Thoughtful and good people do work together to effect change in the ways they can. Banding together with like-minded individuals is easier than going at it alone. People are, for the most part, generous and well-intentioned. That worry solves very little. It adds to my level of stress and doesn’t help with resolutions. Anxiety is my personal battle, and I often think I have to be entirely self-sufficient. This is a myth I’ve created in my life. “Let go and let God,” has always seemed a trivial/saccharine saying, but I’m starting to credit that approach with more peace of mind. I want to try my best at those things I can change, but. . .there are things in life you will never have control over. Attempting to will change in those situations is draining and not the best use of my energy. I WILL invest trust- in the stranger, in the universe, in God, in every loved one. I will be hurt at times, but I will also be surprised by goodness, and that is worth believing in.